What is the Best Food Sensitivity Testing Method? Many people go through life with chronic inflammation and poor health without knowing that the foods they are eating could be causing their health issues. Even healthy foods can be harmful to your body when you are sensitive to them. Luckily, we are now able to test for food sensitivities. When you have food sensitivities, your body reacts to certain foods as a threat with an overactive immune response. Repeated exposure to the problematic foods can result in chronic inflammation and other health problems. It is estimated that 45-75% of individuals have some type of food sensitivities. There are numerous symptoms associated with food sensitivities. Symptoms can be delayed up to 72 hours after consuming the food and can manifest in many different bodily systems. Digestive issues, fatigue, migraines, joint pain, skin issues, and many more health problems are linked to food sensitivities. Many people use the terms “food sensitivity”, “food allergy”, and “food intolerance” to describe any adverse reaction to food. Sensitivities differ from intolerances and food allergies, and it is important to understand the differences. Food allergies can be life-threatening and the symptoms are immediate. Wheat and gluten, soy, dairy, fish, shellfish, eggs, peanuts, and tree nuts are the most common food allergens. Food sensitivities can be to any food, especially those you eat the most. Food sensitivities can be resolved by removing the problematic foods from your diet and allowing your gut time to heal. 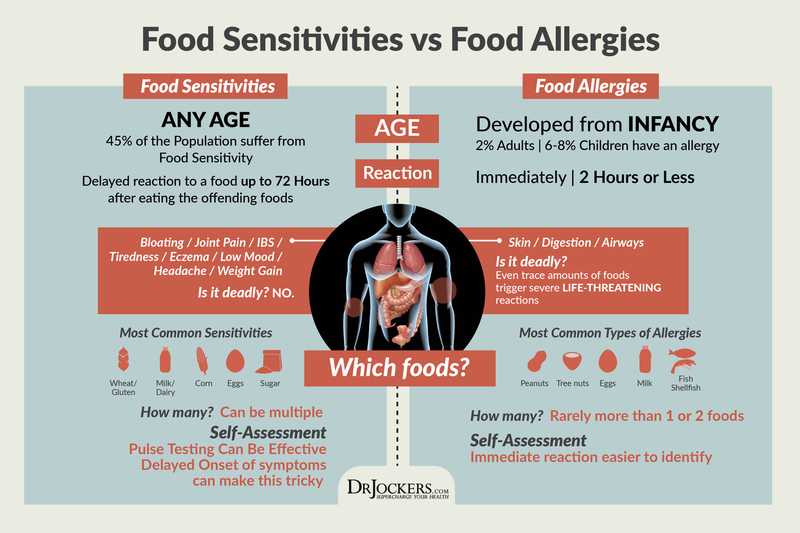 Why Test for Food Sensitivities? 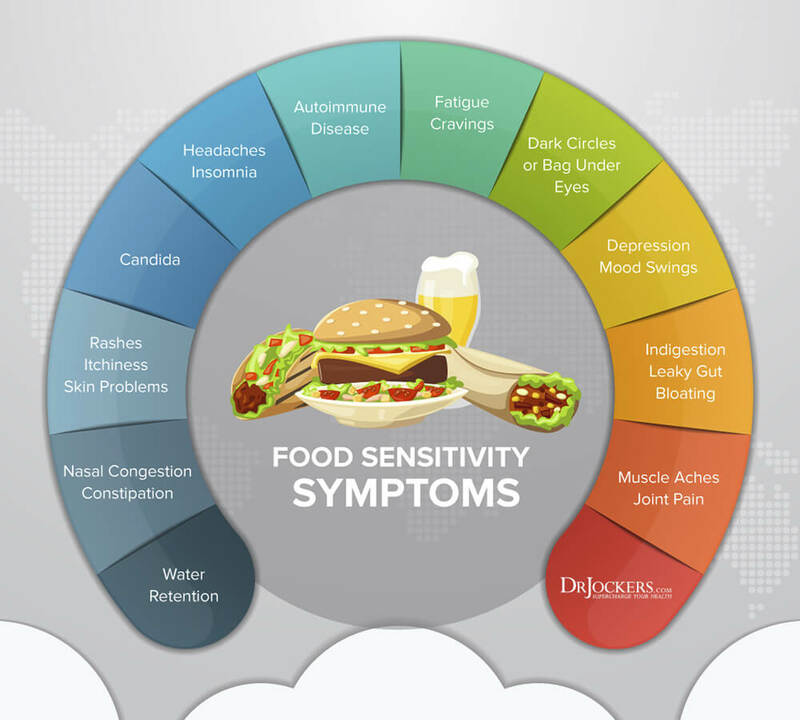 Because food sensitivities have delayed symptoms, it can be difficult to pinpoint which foods are causing the symptoms. This is where food sensitivity testing is critical. By using food sensitivity testing, you can determine which foods should be removed from your diet. This article will explain food sensitivities including the causes of food sensitivities and how they are distinguished from food intolerances and food allergies. I will also discuss the health consequences of food sensitivities and the best way to test for food sensitivities. Your immune system is responsible for identifying and destroying foreign substances (antigens) in the body such as bacteria and viruses. To fight these foreign substances, the immune system produces antibodies (or immunoglobulins). These antibodies are produced to keep our bodies healthy when antigens enter the body. When we are sensitive to foods, the antibodies become confused and attack food proteins. The antibodies produced with food sensitivities are IgE, IgG, IgA, and IgM, representing either an immediate or delayed response. Immunoglobulin E (IgE) antibodies are produced immediately in response to food allergies. These antibodies are found on the surface of mast cells. When activated, IgE antibodies trigger the mast cells to release various chemical messengers causing the symptoms associated with a severe food allergy. Symptoms occur in the areas that have a lot of mast cells, such as the skin, nasal passages, and gastrointestinal tract. The major food allergens are including in specific IgE food panels to test for this immediate reaction. The immunoglobulin A (IgA) antibody is a delayed response antibody. IgA is found in high concentrations in the mucous membranes lining the gastrointestinal tract and respiratory passages. Immunoglobulin M (IgM) is the first antibody produced immediately after exposure to an antigen. IgM antibodies are found mainly in the blood and lymph fluid. The largest circulating antibody is immunoglobulin G (IgG). It is found in all body fluids and protects against bacterial and viral infections. There are four subclasses of IgG. IgG1 responds to new food antigens. IgG2 and IgG3 react to cell surface oligosaccharides of viruses, protozoa, and foods. IgG4 is related to delayed food sensitivity symptoms. A test for food sensitivities will commonly look at IgG and IgA reactions to different foods. We will discuss the best test for food sensitivities later in this article. It is important to understand and address the underlying causes of food sensitivities. While there are various influences that can cause an abnormal immune reaction to food, leaky gut syndrome is one of the main causes of food sensitivities. Leaky gut syndrome, or intestinal hyper permeability, is a condition in which the tight junctions in the gut lining become too large and abnormally permeable. Undigested food particles and toxins can pass through these holes in the gut lining and into the bloodstream. This causes the immune system to overreact and produce antibodies. There are other potential causes of food sensitivities. Food sensitivities are linked to imbalances of intestinal microbiota and to chronic stress. Exposure to pollution, pesticides, chemicals, additives and preservatives in our foods can also cause food sensitivities by straining the immune system (1). A strained immune system is less able to respond appropriately to antigens in food. Intolerances and sensitivities are similar and can have the same symptoms. The main difference in the two is that a food sensitivity causes an immune reaction whereas a food intolerance occurs when the body has difficulty digesting certain foods. When you are intolerant to a food, it is most often because your body does not produce any (or enough) of the needed enzymes to digest the food. Testing for food intolerances will look for digestive enzyme deficiencies and underlying causes rather than immune system responses. The symptoms of food intolerances are varied and can include migraines, cough, and gastrointestinal issues such as bloating, gas or diarrhea. Dairy, gluten, and gas promoting foods like beans are most common food intolerances. For example, a person will have lactose intolerance when they do not produce the enzyme lactase (or enough of the enzyme) to be able to digest milk. Histamine intolerance is another example of a food intolerance. Histamine is an inflammatory molecule that helps regulate immunity. An individual with histamine intolerance has an exaggerated reaction to high histamine foods (such as fermented foods and beverages, vinegar, cured meats, soured foods, citrus fruits, dried fruits, aged cheeses, nuts, and processed foods) or foods that produce histamine (such as alcohol, cow’s milk, avocados, nuts, and bananas). The causes of the exaggerated reaction to high histamine foods could be insufficient DAO enzyme production (needed for proper histamine metabolism) or elevated histamine levels. To reduce the symptoms associated with a food intolerance, you would need to reduce your exposure to these foods and take steps to improve your enzyme levels. Both food sensitivities and food allergies cause an overactive immune response and are often confused with each other. They have important differences. Food allergies are serious and potentially life-threatening conditions (2). They cause an immediate and severe immune reaction that affects numerous organs in the body. They also trigger the IgE portion of the immune system. Symptoms of food allergies include swelling, rashes, hives, itchiness, throat closing, and anaphylactic shock. Food sensitivities, on the other hand, cause a delayed reaction and trigger the IgA, IgG, and IgM portions of the immune system. This type of response does not create the acute effects of an allergy. 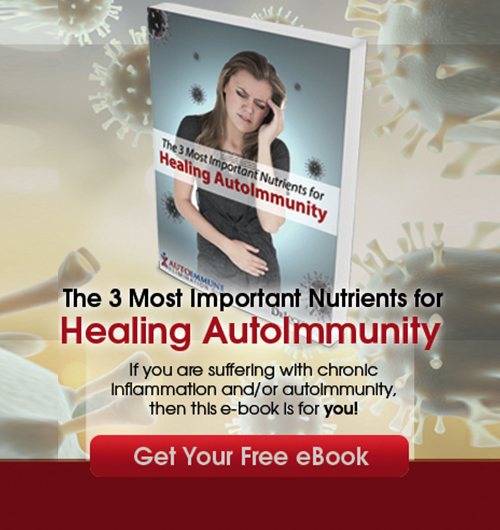 They do throw off the immune system and create a chronic source of inflammation that can cause numerous health issues in the future, however. Because of the delay in symptoms, it is difficult to determine which foods are problematic without testing. Finding the right test for food sensitivities can be very important for overcoming various health conditions. Food allergies affect around 15 million Americans, including one of every thirteen children (3). You can develop a food allergy as a child or as an adult. Food allergies can be to one food or several foods. If you have a food allergy, it is critical to avoid the allergenic food in all forms. There are numerous ways that food sensitivities can impact your health. Eating problematic foods can cause immediate or delayed symptoms in numerous bodily systems. Repeated exposure to these foods creates inflammatory spirals that can damage brain tissue, joints, skin, and organ systems. Digestive symptoms are common with food sensitivities. Possible digestive problems include irritable bowel syndrome (IBS) and leaky gut syndrome. Diarrhea and/or constipation, bloating, gastritis, reflux, and associated malabsorption and nutrient deficiencies, can result from food sensitivities. A leaky gut can cause food sensitivities and consuming inflammatory foods can make the gut more permeable and prevent the gut from healing and sealing. Food sensitivities inflame the gut lining, creating this cycle of gut permeability and more food sensitivities. Since at least 70% of the immune system is in the digestive tract, gut irritation results in an inflammation throughout the body (4). There are physical manifestations of food sensitivities. Dark circles or bags under the eyes, water retention, nasal congestion, constipation, rashes, itchiness, muscle aches, and joint pain are some of the possible indicators. When you have skin issues such as eczema and psoriasis this can indicate that you are sensitive to foods. People with food sensitivities can also have neurological symptoms such as migraines, memory problems, chronic fatigue, mood swings, ADHD, and neuropathy. They can even cause insomnia, depression, mood swings, and cravings. Food sensitivities can interfere with the metabolic, endocrine and hormonal systems, resulting in obesity, diabetes, metabolic syndrome, poor thyroid function, and more. Other symptoms include lowered immune system, autoimmune diseases, arthritis, and respiratory issues. As we discussed already, these wide ranging symptoms may be in large by the breakdown of the gut barrier and contribution to leaky gut. As you can see, there are wide-ranging health effects of consuming foods that you are sensitive to on a regular basis. Identifying your own sensitivities and removing them from your diet may make a tremendous impact on your health. Next, we will cover finding a test for food sensitivities that meets your needs. Testing for food sensitivities is essential to avoid the inflammatory cascade that results from repeating exposure to problematic foods. Finding the right test for food sensitivities will help identify which foods are inflaming the gut so that you can avoid those foods and allow the gut time to heal and seal. Food sensitivities are mediated by multiple pathogenic mechanisms, and there are numerous clinical and immunologic complexities associated with food sensitivities. This gives rise to numerous options for food sensitivity testing. Biofeedback testing, immunoglobulin testing, mediator release testing, muscle response testing, and cellular testing are different types of food sensitivity testing options. I will briefly review the major options for food sensitivity testing, and then explain why the Cyrex Array 10-90X is the most thorough and accurate means of testing for food sensitivities. Three non-invasive, inexpensive food sensitivity testing strategies are pulse testing and an elimination diet. In this category is muscle response testing, which can be done at home or with a trained practitioner for best accuracy. Nambudripad’s Allergy Elimination Techniques (NAET®) uses muscle response testing to confirm the presence of allergic reactivity (7). Changes in muscle strength are assessed while a person is exposed to a food. Muscle weakness is thought to indicate that the food is problematic. Once a food sensitivity or allergy is identified, NAET claims to be able to eliminate the allergy with spinal manipulation, acupressure and/or acupuncture and energy balancing. The treatment strategy is to reprogram the brain’s negative responses towards the food through desensitization. Muscle response testing does not look at immunoglobulins, the most important players in food sensitivities. This method is not generally accepted as an accurate test for food sensitivities. Pulse testing is a biofeedback test for food sensitivities. This method measures the stress response caused by foods based on the increase in your heart rate. Problematic foods activate the sympathetic branch of the autonomic nervous system, signaling a fight or flight response in the body and increasing blood pressure and heart rate. Measuring your pulse rate when exposed to specific foods can indicate whether the foods activate this stress response. If you don’t feel comfortable testing your pulse on your wrist, you can also purchase and use a pulse oximeter that records both your pulse and your oxygen concentration. This is a very helpful and inexpensive piece of equipment that will help with the testing. I recommend this one. 7: Note the difference between normal heart rate and food challenge heart rate. The following graphic depicts what should be interpreted from the results of your pulse test. 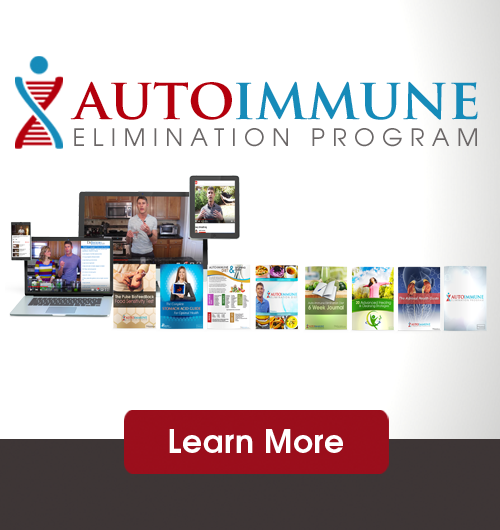 An elimination diet is a test for food sensitivities where specific foods are eliminated for around 6 weeks. The foods eliminated are those that are most commonly allergenic or inflammatory including gluten, dairy, sugar, eggs, corn, soy, vegetable oils, grains, shellfish, tree nuts, legumes, and nightshade vegetables. Once these foods have been removed from the diet for the elimination period, you slowly reintroduce each food one at a time. It is important to keep a journal during the entire process to document how you are feeling as you eliminate and reintroduce the foods. You want to note any reaction or symptom that improves with elimination or worsens/reappears with reintroduction. Using biofeedback strategies to test for food sensitivity testing can be time consuming and difficult to implement. It can be challenging to eliminate or pulse test all offending foods and pinpoint the foods that could be causing your symptoms. There are several different ways to test blood for food sensitivities. These include the mediator release test (MRT), cellular testing to look at cellular reactions used in the popular ALCAT test and traditional ELISA testing looking at specific immunoglobulin reactions. All of these methods have been used successfully for many people over the years but they are not all the same and there are pros and cons to each method. One way food sensitivity symptoms manifest is by the production of cell mediators. The Mediator Release Test for food sensitivities quantifies the inflammatory response of these cell mediators to food and food chemicals (5). The release of pro-inflammatory and pro-algesic mediators (cytokines, histamine, leukotrienes, prostaglandins) from white blood cells (neutrophils, monocytes, eosinophils and lymphocytes) is a common component of all diet-induced inflammatory reactions. The release of these mediators causes symptoms connected to food sensitivities. The MRT measures volumetric changes in lymphocytes, neutrophils, monocytes, and eosinophils to quantify the level of inflammation caused from the food. In this way, the individual gains insight into the foods causing the most inflammation and the foods that do not provoke inflammation. The MRT identifies any non-IgE reaction. However, research is limited and the food sensitivity testing is expensive. The Alcat (Antigen Leukocyte Cellular Antibody Test) is a blood test that measures cellular reactions to over 450 foods and other substances (6). The Alcat test measures food and immune reactions through stimulation of leukocytes. The leukocytes comprise five classes of white blood cells, including monocytes, lymphocytes, eosinophils, basophils, and neutrophils. Foods and substances tested by the Alcat include individual foods, additives, colorings, molds, functional foods, medicinal herbs, chemicals, and environmental substances. The ALCAT test reports the foods which cause a reaction, categorized by severe, moderate, and mild. The Alcat only measures adverse white blood cell reactions, it does not look at antibody reactions or sensitivities caused by IgM pathways. Cell mediated pathways can also be missed. There is inadequate research verifying this technique, and many researchers do not believe Alcat is a reliable and reproducible test for food sensitivities. IgG, IgA and IgM are the antibodies triggered in food sensitivities. Measuring these levels gives a better understanding of the immune response to foods. Variations of immunoglobulin tests for food sensitivities use ELISA methodology, directly or indirectly. Food sensitivity testing can be distinguished by the immunoglobulins tested, foods (antigens) tested, and method of testing. The ELISA (Enzyme-Linked Immunosorbent Assay) method involves a protein that catalyzes a biochemical reaction (enzyme), an antibody, and an antigen (immunologic molecule). Food particles (antigens) are attached to a surface, then an antibody is applied over the surface so it can bind to the antigen. This antibody is linked to an enzyme and will produce a signal which indicates the quantity of the antigen in the sample. Through this method, the antibodies detect the immune responses in the body. ELISA testing can also be used to measure zonulin levels which can be indicative of leaky gut and food sensitivities. Zonulin controls the size of the openings between your gut lining and your bloodstream. High levels of zonulin can be which can be triggered by gluten, parasites, candida, and harmful bacteria. Abnormally high levels of zonulin, can cause these openings to become too large and permeable. As discussed above, gut permeability is linked to food sensitivities. There are several food sensitivity tests that use the ELISA method including the Food Test 95, the Dietary Antigen and Environmental Allergen Exposure Profile, and the Cyrex Array 10-90X. The Food Test 95 is a test for food sensitivities using the ELISA method (8). The test is done by dried blood spot from a finger prick. The test analyzes only the IgG antibody and tests 95 foods, fewer than other immunoglobulin tests. The Dietary Antigen and Environmental Allergen Exposure profile is food sensitivity testing that measures multiple antibodies, IgE, IgG and IgG4 (9). The test uses an indirect ELISA and measures both IgG and immune complexes for complement activation. Bacteria, viruses, protozoa, and allergens are attacked through the complement pathway. This pathway is clears threats by initiating inflammatory cytokines, mast cell degranulation, and cell membrane destruction. While this can be protective, it can damage tissues if not kept under control. IgG1, IgG3, and IgM can activate complement. The Dietary Antigen and Environmental Allergen Exposure Profile measures complement activation and the four subclasses of IgG antibodies for 88 foods. This food sensitivity testing method detects the delayed allergic response that is mediated by an IgG response and immune complexes. The Cyrex Array 10-90X is a multiple food immune reactivity screen using the ELISA method (10). There are 10 advanced technologies used in the Cyrex Array 10-90X that make it the gold standard for food sensitivity testing. The Cyrex Array 10-90X is a dual-antibody test, evaluating both IgG and IgA antibodies. Some people produce more IgA than IgG antibodies or vice versa. Combining the two antibodies on one panel reduces the possibility of missing reactivity. The Cyrex Array 10 is unique in that it analyzes 180 cooked, raw, and modified foods, depending on how the foods are usually consumed. Heating a food to 118 degrees or more changes the protein structure and antigenicity. The Array 10 minimizes the risk of missing reactivity to foods by testing reactivity to foods the way in which foods are most likely consumed. The Array 10 tests for reactivity to common food combinations in addition to the individual food proteins. It tests for reactivity to binding isolates such as plant-derived lectins and agglutinins. Cyrex detects both the whole food immune reactivity, and the possible reactivity to a small specific peptide within that whole food, using a targeted protein amplification process. Meat glue is used to form larger pieces of meat from small pieces. The Cyrex Array 10-90X tests for reactivity to meat glue or reformed meat. It also tests for reactivity to cross-reactive antigens and pan-antigens which can cross-react with human tissue. Artificial food colors, small-molecule chemicals, and oil proteins (called Oleosins) are also tested. Antibodies to large gum molecules which can cause immune reactions are also tested in the Array 10-90X. This can be particularly helpful for individuals on a gluten free diet because gluten free products often have gums to hold ingredients together. Another unique aspect of the Cyrex test is that all tests are performed in duplicate samples. Using duplicate assays results in close to zero probability of error. When the samples correlate within plus or minus 20%, the results are reported. If the samples do not correlate, the assay is repeated with replicate samples until the correlation is made and then it is reported. The Cyrex Array 10-90X is a comprehensive and reliable food sensitivity testing method. The advanced technologies used in the test distinguish it as the best food sensitivity testing option available. 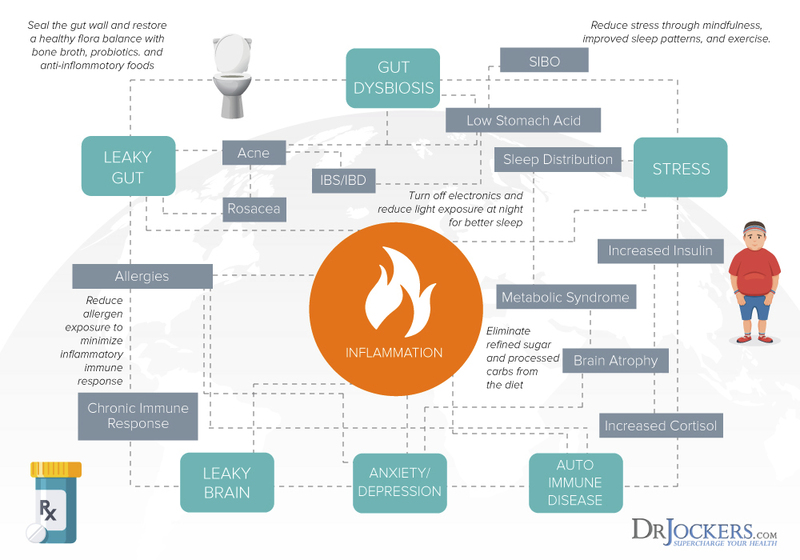 For many people, food sensitivities and leaky gut syndrome are the root cause of their chronic inflammation and health issues. They are linked to many health problems, including digestive issues, muscle aches and joint pain, migraines, chronic fatigue, insomnia, and skin rashes. Food sensitivities can also cause the immune system to react to foods as a threat and produce immunoglobulins in response. 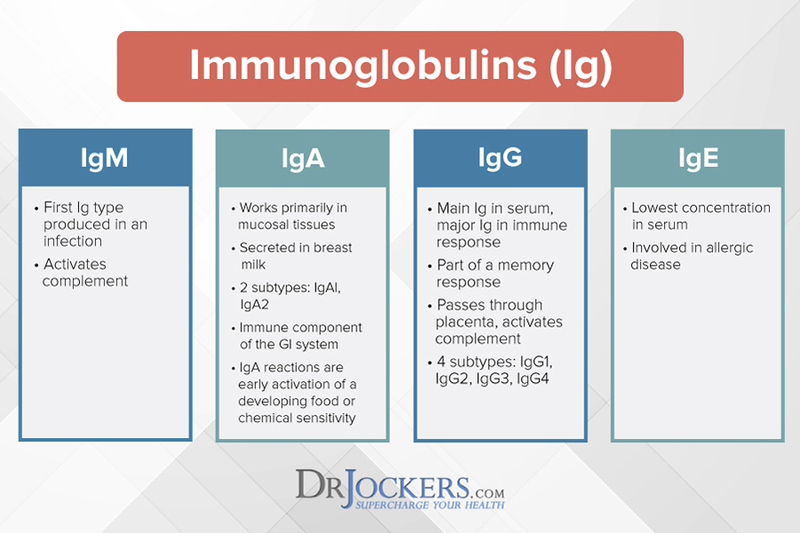 The immunoglobulins produced with food sensitivities are IgG, IgA, and IgM. Repeated exposure to problematic foods results in an inflammatory cascade affecting multiple bodily systems. Food sensitivities are caused by leaky gut syndrome, imbalances in gut microbiota, chronic stress, and exposure to pesticides, chemicals, additives, and preservatives in food. Food sensitivities can be resolved by removing the problematic foods from the diet and allowing the gut time to heal and seal. It can be difficult to identify which foods are causing a reaction because symptoms resulting from food sensitives are usually delayed up to 72 hours after eating. It is important to do food sensitivity testing to determine which foods are causing an exaggerated immune reaction and inflaming the body. 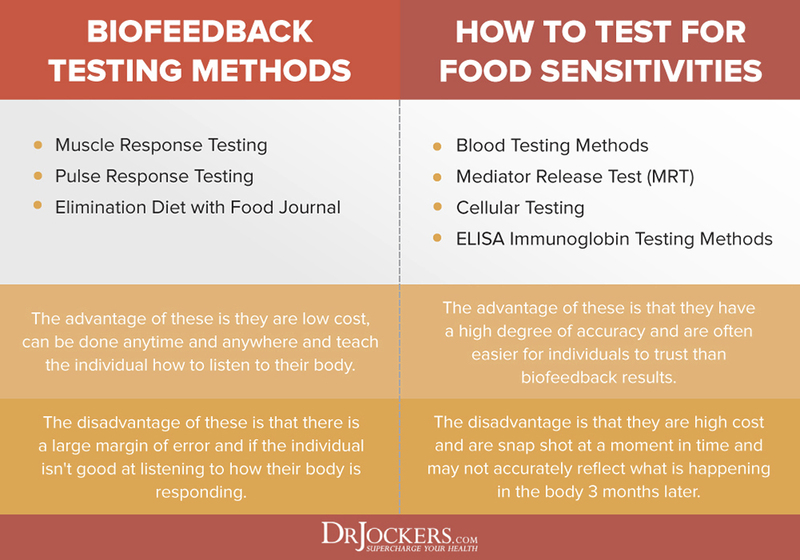 There are numerous options for food sensitivity testing including biofeedback strategies, muscle response testing, cellular testing, mediator release testing, and immunoglobulin testing. The most thorough and reliable test for food sensitivities is the Cyrex Array 10-90X. The Cyrex test uses 10 advanced testing technologies. It is a dual antibody test evaluating both IgG and IgA antibodies. It also analyzes foods cooked, raw, or modified depending on how the foods are usually consumed. Other technologies include testing for cross reactive and pan-antigens, reactivity to food combinations, and testing for food gums, artificial coloring, small molecule chemicals, and oil proteins. The Cyrex 10-90X uses a dual verification process. Samples are run in side by side duplicate and correlation between the tests must be met before reporting the results. The technologies and validation processes used by Cyrex make the 10-90X the gold standard in food sensitivity testing. Can I do the Cyrex Array 10-90X test at home or does a doctor have to order it? If so are there certain doctors that can? You can have this done at a local blood draw center. If you need help locating one, you can call the customer service number at the top right of the page! But Dr. Jockers, there are some “superfoods” in the list of foods I am sensitive to. How long after eliminating the sensitive foods from my diet can re-introduce them into my diet? Will my body ever grow tolerance for these foods or is it like a ‘done deal’? What about eating them in rotation like once in 4 or 5 days? Please answer, thanks. I have been breaking out with spotty, pimple-like spots for years (20+). Gradually, they became boil-like. Now, I am breaking out with what look like blisters all over my arms, legs, shoulders, back, and buttocks. They are itchy and burning. They end up being very deep and leaving big holes in my skin. I am a veteran and they keep (17+ years) telling me I have “Pickers”. Please help!?!? I am in misery and don’t know what to do next. I have been gluten-free for several months, and about a month ago I had a blood test for celiac that came back negative. I do have hypothyroidism as well. This test is so expensive. Geeze. Also, there is no reliable test for chemical sensitivities AT ALL. Regarding the pulse rate test step 6, do we wait another 60 seconds for the final bpm? I have a pulse oximeter and noticed the number is higher at the very beginning ( after waiting 20 seconds with challenged food in mouth) and then comes down. Thank you. Yes it is a good idea to go a full 60 second to get the most accurate measurement. The 7 Steps to Reduce Food Sensitivity Photo is very interesting. Can you tell me where I can read more about that? What is your view on food sensitivity tests using saliva? So sorry to hear this! It may be helpful and so glad he is doing better! Praying for you!! So sorry to hear that! We are praying for you and your granddaughter! I am interested ordering Cyrex Array 10 – 90X. Could I have an example how would the test result look like? Also, Do I need to pay the lab (for blood drown) on the top of $677? It’s a little bit unclear on your web.